The architect Hasse Hägerström graduated from the Helsinki University of Technology in 1970. Today, he is a partner in the architectural firm A-konsult in Helsinki. 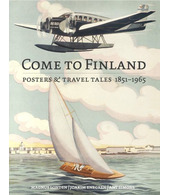 During his time as a student, Hägerström was asked to draw the Finlandia-poster for the Finland Steamship Company. Hägerström remembers that the company predicted that the high-speed ferry, Finlandia, was to mark a new era within ferry traffic. Thus the ferry was portrayed as a booster rocket.